Ever wondered what makes a pair of lips particularly alluring? Well science has an answer: The Golden Ratio. The Golden Ratio, also referred to as Phi, is a ratio of 1: 1.6. It is a universal concept seen in the pyramids, classical architecture, and even the spiral pattern of leaves. Lips that adhere to the golden ratio have an upper lip that is slightly smaller than the bottom, by roughly a 1/3rd. Now, don’t just take our word for it. Several scientific studies have shown that faces which adhere to the golden ratio are deemed to be more attractive. This is even the case with babies who were stare at golden ratio faces for much longer that faces that did not display these proportions. So how can you get the perfect lips? 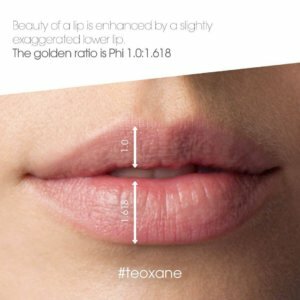 Our doctors will consult with you an analyse your natural lip shape and volume and come up with a treatment plan that gets you as close to the golden ration as possible. By using these principles, your lips will appear natural and alluring, not distracting and overdone. It is also crucial that we use the right dermal filler when sculpting lips. The ideal filler is smooth, soft and hydrating. It should stay within the confines of the lip rather than spread to the surrounding tissues ( the dreaded duck phenomenon). There are countless dermal filler brands on the market, but we have found that Belotero gives a subtle yet beautiful effect when used on the lips. Due to its unique formulation the Belotero also remains with in the contours of the lip, so the end result appears natural. So why not come in for a consultation with our cosmetic doctors. Together we can get you the perfect lips.